When I moved to Georgia when I was starting 2nd grade, I think it was destined that Shelley and I become best friends. Her parents and my Mom went to school together and at the time, our dads worked at the same place and while I don't remember the very first day we met, I know that we immediately hit it off. We spent a lot of time together, having sleepovers and taking dance classes (clogging to be more specific). Once, in 3rd grade, she even let me "look" at her paragraph about Thanksgiving. I forgot all about doing it and panicked when I realized I didn't have it. Shelley showed me her paragraph and I might have copied it. I thought I did a pretty good job of changing some words around in the 10 minutes I had to write it, but our teacher, Ms. Roberts, was pretty savvy and she knew right away when I read my paragraph out loud right after Shelley! We didn't get in trouble, but I think Ms. Roberts knew that her disapproving look was enough to punish me. The day I do remember was the last day of 3rd grade, which was Shelley's last day of school with me. She and her family were moving 2 hours away (which is basically forever away to an 8-9 year old) and she wasn't coming back to school next year. I remember hugging her good-bye and watching her car drive off. She was in the backseat looking back and waving at me. It was sad and I remember hanging my head and walking to the car. Seriously, if that moment was captured in a movie, you'd cry. We kept in touch after that though, through letters and phone calls. Over the summer months, I would go down to her house and she would come up to mine. We always had fun. Of course, as you get older and life gets in the way, you can lose touch with loved ones. I think high school and college took over for both of us and we didn't hear much from one another. And then along comes Facebook. I was beyond excited when we found each other. It had been so long since we had been in touch and it was great to see pictures of her and to read what all she had been doing. I can understand how some people don't like Facebook and refuse to be on there, but personally, I like it because it helps people re-connect. And I'm so happy to be back in touch with Shelley, my very first best friend. But what can bring you joy can also bring you other news. I found out that Shelley had been diagnosed with breast cancer, and not just any cancer, Triple Negative Breast Cancer. I had never heard of this form of cancer, and to be honest, I didn't even know there were different kinds. Types of breast cancer are diagnosed by the presence of estrogen, progesterone, and human epidermal growth factor receptors and successful treatments target these receptors. With Triple Negative Breast Cancer, these receptors aren't found, therefore there are currently zero treatments to target this subtype of breast cancer. While TNBC is responsive to chemotherapy, it can be aggressive so there needs to be targeted treatments specific to this subtype. I made these Pink Velvet Cupcakes in honor of Shelley and to spread awareness of TNBC. The more we know, the more we are aware, and the more we can do. In a large bowl of an electric mixer, cream together the butter and the sugar until light and fluffy, about 2-3 minutes. Next, add a small amount of pink food coloring and then increase the amount until you reach the desired shade. Blend well with the butter mixture. Next, add the eggs, one at a time, beating well after each addition. Add the vanilla extract until combined. In a separate bowl, combine the flour, baking powder, baking soda, and salt. Add 1/3 of the dry ingredients to the batter and mix until combined. Then, add about 1/2 of the buttermilk and beat until combined. Add another 1/3 of the dry ingredients, the remaining buttermilk, and then finally the remaining dry ingredients. Beat until well combined. Fill the cupcake liners about 2/3 of the way full with the batter. Bake for 20-23 minutes or until a cake tester (or toothpick) comes out clean. Cool the cupcakes for about 10 minutes before removing from the pan and then transfer to a wire rack to cool completely before you frost. In a large mixing bowl, cream the butter for about 10 seconds and then add the powdered sugar, once cup at a time, mixing after each addition. Next, add the vanilla extract, pinch of salt and 2 tablespoons of whipping cream. Beat until combined. 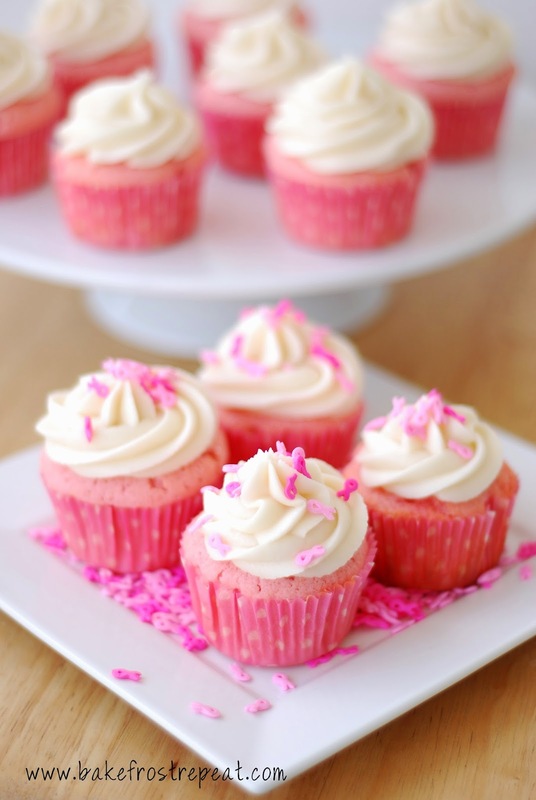 If the frosting is too thick to spread or pipe onto cupcakes, add some more whipping cream, one tablespoon at a time. Aw, such a sweet story about your friend and I love that you were able to reconnect. I have never heard of that type of cancer either. 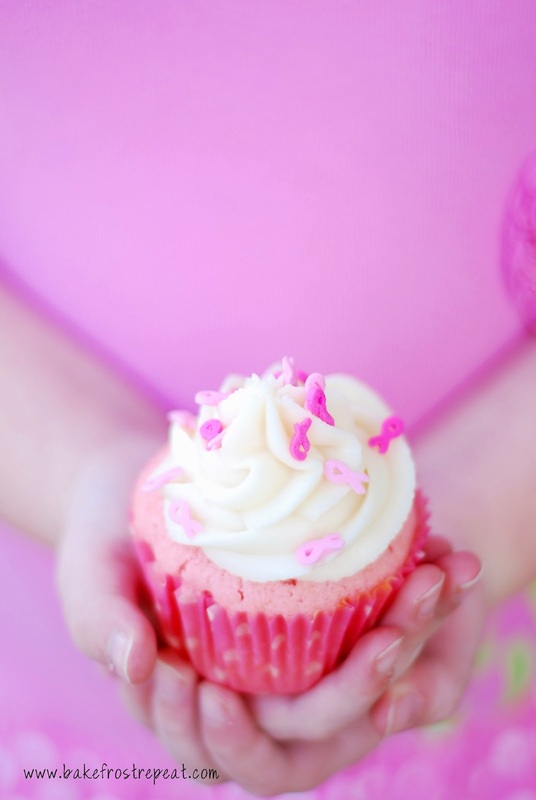 These pretty pink cupcakes are just perfect for your sweet friend. I'm so sorry to hear about your friend. I've never heard of that type of cancer, either (and I hope I never hear of it again). Sending good thoughts for recovery for her, though. The cupcakes are lovely. As a cancer research myself, I can certainly appreciate spreading the word about this type of cancer. Great post! I'm a convert to pink velvet - it is so pretty and much cuter than its red counterpart! :) Thanks for sharing this sweet story to start our weeks off well! Shelley sounds like a such a lovely person and how awesome of you to spread awareness about this type of cancer through one of the things you do best - baking! Absolutely breath-taking pictures, too! I'm sorry to hear about your friend, Shelley!! But I love the story that you stayed in touch and I LOVE that you shared a story involving Mrs. Roberts. At least her disapproving look was enough for you. My brother was in her class and for his friend, Mark, a look wasn't enough. She picked up his desk (with him in it of course) and shook. BUT, she was my brother's favorite teacher ever I think.